This is the latest Kodak all-in-one wireless inkjet printer. It is a compact wireless printer, copier and scanner that helps you save up to 50% on the cost of ink. It also helps you use up to 30% less ink with the all new Eco Button. It scans straight to your smartphone. 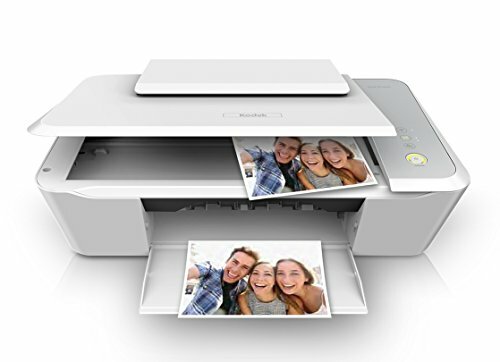 And it lets you print photos from your favorite social media site or an address for envelopes wirelessly. Say hello to the easy to use, all-new, KODAK VERITE 50 Wireless Printer. This easy to use printer is perfect for anyone that is tired of paying for the high cost ink. It's very easy to use, very easy to set up, and very easy on your budget. Kodak Verite Wireless Printer, Scanner, Copier prints wirelessly from MAC, PC, and your Smart Devices. Flick to Print feature lets you quickly Print photos straight from your smart Phone to unleash your most precious memories. Compact photo quality printer with easy Wi-Fi set up from your smart device through the Kodak Verite App for iOS and Android.